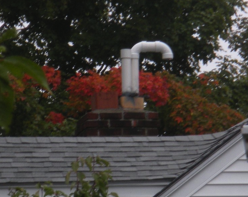 September 2012 - In this installation the plumber installed a PVC vent inside of a clay lined double flue chimney. The other flue in the chimney vents a fireplace, the problem we are finding is when homeowners light a fire in their fireplace the PVC in the heating system flue can melt and cause a serious carbon monoxide and flue gas danger. In these (now common) types of installations we strongly recommend the replacement of PVC vent with a chimney liner made from a stainless steel alloy such as AL29-4C which is specifically made for venting condensing heating systems and usually comes with a lifetime guaranty (from many manufacturers) against corrosion in that type of application. We also recommend moving the intake vent out of the chimney to prevent the corrosive by-products of combustion from being drawn into the heating system intake which can actually damage the heating system over time. Even though PVC pipe should not be confused with other non-metal (plastic) vent products that some companies are manufacturing such as polypropyIene vent systems, these other non-metal (plastic) vent products should still never be put in a multi flue chimney that vents a fireplace or solid flue appliance because those types of non-metal vent products are still not designed for use near such high temperatures and this is an application that manufacturers don’t even test. For more information on whether PVC should even be used at all to vent flue gases (never mind in a double flue chimney) I suggest reading the following two articles from Plumbing Engineer Magazine, which is a leading publication in the heating industry. It is my hope that the building code will soon ban the use of PVC and plastic vents in multiple flue chimneys where melting of the heating system vent pipe by the use of another flue is a dangerous and deadly possibility. President, Ron George Design & Consulting Svcs. I recently inspected the mechanical systems in student housing at a Midwest university. The school had hundreds of apartments in numerous buildings with high efficiency water heaters that were installed more than 10 years ago. There were reported problems of not having enough hot water. My inspection revealed a high efficiency water heater with purple/brownish PVC pipes and yellowish PVC flue pipe fittings. The flue pipes were obviously deformed from heat, and they were sagging. A maintenance man for the university said that some really bad pipes had come apart at the fittings and melted. This set off the carbon monoxide alarm and prompted a maintenance call. The water heater had scaled up due to minerals in the water supply; this caused the flue gas temperatures to rise, which created the noted problems. The pipe was Schedule 40 PVC pipe. Although the water heater installation manual we obtained recommended using PVC pipe as a flue material, PVC pipe manufacturers do not recommend this. I called the manufacturer of the PVC pipe in this case and asked the representative a few questions about using PVC pipe as a combustion flue for fuel gases. He was quite familiar with this issue and emailed me a link to the company’s technical manual, which discussed all of the physical and temperature limitations of the piping. He said that the company has had numerous complaints about PVC pipes used for venting flue gases, and that they always point out that they do not recommend this usage and that there is no listing for it in their manual. He has asked every major manufacturer of boilers and water heaters for data to support the recommendations in their literature for the use of PVC pipe for combustion flue materials but has not received any replies. This is concerning to me. Just because a manufacturer recommends using PVC does not mean that it is acceptable or safe. Just because PVC works in new installations does not mean that a condition cannot occur in which scale builds up over a short time in hard water areas and causes high flue gas temperatures. Most boiler and water heater manufacturers list other ways of venting with stainless steel, but they seem to always recommend the cheapest way in their literature, in an attempt to make the boiler seem more affordable to consumers. The piping manufacturer recommends that inquiries about the suitability of plastic piping systems for venting combustion gases should be directed to the manufacturer of the water or space heating equipment being installed. Furthermore, several of the ASTM standards applicable to PVC plastic pipe and fittings that this company manufactures their pipe to include the following note: This standard specification for PVC pipe does not include requirements for pipe and fittings intended to be used to vent combustion gases. There is no standard referenced in any of the codes in the United States for a plastic flue vent for combustion flue gas piping, although many water heater and boiler manufacturers recommend this. There is a Canadian standard, ULC S636, but that standard has several flaws in that it allows flue gas temperatures that exceed the temperature limits of the pipe material manufacturers. The maximum temperatures listed in the ABS, PVC and CPVC pipe manufacturers’ technical literature are shown in the following table. Any temperatures above the rated temperature will allow the pipe to melt, sag and, possibly, collapse or pull apart. There are serious consequences with carbon monoxide asphyxiation and fire that cannot be ignored. Generally, for a new condensing water heater or boiler, the stack temperature will be about 20 degrees higher than the water temperature. The design and efficiency of the unit, along with several other factors, including water quality, will affect the stack temperature. If a water heater is set to store water at 140 F to minimize Legionella bacteria growth, the flue gas temperature will be about 160 F when the heater is new. As scale builds up and the heater efficiency falls off, the flue gas temperatures can easily increase to over 350 degrees F. Even if someone had their water heater set at 120 F, with scaling, the flue gas temperatures can rise well above 300 F. Boiler thermostats or burner controls are generally limited to 200 F, commercial water heater thermostats or burner controls to 180 F and residential water heater burner controls to 160 F, and all can overshoot by several degrees. As scale builds up on the heating surfaces, the scale insulates the flue gases from the hot water in the system, causing the flue gas temperatures to increase. Some boiler and water heater manufacturers offer stack or flue gas temperature gauges as a way to see whether the unit is scaling up and losing efficiency, which is helpful for monitoring the flue condition. A temperature sensor or probe with a high-limit control could be inserted into the flue at the flue connection to the boiler or water heater. This control would shut off the burner if the flue gas temperature exceeds the temperature rating of the flue pipe. A standard will be needed for plastic flue pipes that should include a temperature gauge and a high limit probe. Then PVC, CPVC and polypropylene flue gas piping can be safely used on high efficiency boilers and water heaters. This would be an answer to the dilemma of cost versus safety. Without a standard for proper use of these safety devices in combination with plastic flue gas piping or without the use of stainless steel flues, plastic flue materials can melt as flue gas temperatures rise. Not only is energy lost when this happens but flues can become blocked or disconnected, which can be a carbon monoxide or a fire danger. A family of four died in Aspen, Colorado, in 2008, of carbon monoxide poisoning from the failure of PVC plastic flue pipes on a condensing snow melting boiler system in a rental property. The plastic pipe manufacturer was not at fault, because they had published limitations on the use of their piping, and they had not recommended PVC piping for that application. The boiler manufacturer that recommended using PVC pipe as flue material was a target of the liability claim by surviving family members. I have heard arguments by many contractors that do not believe PVC flue venting for combustion gases is a problem, but I have seen melted and discolored piping in many of my investigations, so I know it is a problem. I also see the proliferation of recommendations from high efficiency, condensing boiler and water heater equipment manufacturers for the use of combustible and unlisted PVC piping products as corrosion resistant combustion flue venting. This approach seems to be a way to lessen the initial cost of installing a high efficiency boiler or water heater. High efficiency equipment will cost significantly more than less efficient models, so there seems to be a movement by manufacturers to promote these unlisted and, therefore, non-code-approved materials over code approved and listed stainless steel flues, which are corrosion resistant. 801.20 Plastic Vent Joints. Plastic pipe and fittings used to vent appliances shall be installed in accordance with the appliance manufacturer’s installation instructions. 802.1 General. All vent systems shall be listed and labeled. There is no listing for plastic piping for flue gas venting applications. 304.2 Conflicts. Where conflicts between this code and the conditions of listing or the manufacturer’s installation instructions occur, the provisions of this code shall apply. There is a conflict between sections 801.20 and 802.1. The water heater manufacturer’s installation instructions conflict with the requirement in section 802.1 that requires all vent systems to be listed and labeled for the application. PVC pipe is not listed and labeled as a combustion flue pipe material, as noted in the piping manufacturer’s notes above, yet manufacturers of the water heaters and boilers seem to be avoiding the issue, and they continue to recommend the use of PVC flue venting in their installation instructions. Section 304.2 addresses conflicts. The code restriction requiring all flue materials to be listed and labeled for their intended purpose is more stringent language, so the more restrictive code requirement requiring listed and labeled flue pipe materials would apply. There is additional language in the International Fuel Gas Code. I have not seen any testing data or an independent test report from a boiler or water heater manufacturer that shows that PVC piping has been tested and approved for the conditions it will likely see in a water heating or boiler installation. Any testing should include the extreme conditions when scaling occurs and flue gas temps rise, near the end of the equipment’s service life. This temperature limit was intended to allow the use of PVC pipe for use as a flue gas material. The temperature limit for PVC pipe is 140 F, and the allowable temperature in the ULC S636 standard exceeds the temperature limits set by PVC pipe manufacturers. This temperature limit was intended to allow the use of CPVC pipe for use as a flue gas material. The temperature in the pipe manufacturer technical data is 180 F. The ULC S636 standard allows the material to exceed the limit for CPVC piping by 10 degrees Fahrenheit. This temperature limit was intended to allow the use of Polypropylene (PP) pipe for use as a flue gas material. There is currently one manufacturer listed to this standard, but the potential for the flue gases to exceed the 230 F is still there. A high-limit switch to shut off the boiler or water heater would be advisable. I am not aware of any plastic pipe manufacturers that meet this sub-section of the standard. The potential for the flue gas temperatures to exceed the 230 F is still there. A high-limit switch to shut off the boiler or water heater would be advisable. It will be interesting to see which way the industry goes on this issue. There are forces pulling each way, and I believe that a significant change will be coming within the next few years. I hope the industry can develop a standard to allow low cost, high temperature plastic materials. I believe that we will see a few code changes on this topic in the next round of code hearings. The 2012 Code is nearing completion and should be available in 2011. The 2015 code cycle will begin in the not too distant future. In the May 2011 issue of Plumbing Engineer magazine, I wrote a column titled, “Is PVC an acceptable vent material for flue gases?” in which I pointed out many problems and challenges associated with venting flue gases with polyvinyl chloride (PVC) pipe. In the March 2012 issue, a representative of the Air-Conditioning, Heating and Refrigeration Institute (AHRI) wrote a letter supporting the use of PVC pipe on behalf of their appliance manufacturer members that use PVC as an alternative to the stainless steel or high temperature plastic flue venting materials that are listed for use. AHRI is an advocate on behalf of their members; they lobby at all levels of government, including at model code hearings. AHRI’s government affairs staff works closely with congressional staff on legislation that impacts the industry. In this case, it appears that they were lobbying the readers of Plumbing Engineer on behalf of the manufacturers of fuel burning appliances such as water heaters, boilers and furnaces that are recommending use of PVC pipe for venting combustible gases. Some people have asked why I am making such a big deal over using PVC for venting combustion gases. I would love to tell them it is OK to use these materials, but health and safety trump saving a few bucks on pipe material. Recently, I received a call from someone on behalf of a woman who had suffered a serious debilitating illness. The caller said a plumber gave him a copy of the May 2011 article. The caller went over some of the comments that were addressed in the article and explained that a woman had become seriously ill and permanently disabled from what is believed to be exposure to the combustion gases from two failed PVC plastic flue vent pipes in her home. I was asked to inspect the installation. I photographed, took temperature recordings and used a multi-gas detector to take readings. The two PVC flue vents were connected to two water heaters that were piped together in the garage of a three-story townhome. The plumber had found that the flue pipes in separate joist spaces were completely separated and that what appeared to be carbon monoxide poisoning and oxygen deprivation may have caused the woman’s illness; she apparently has brain damage and is now permanently disabled. In exposed locations, the PVC pipe was tan colored; above the drywall and below the second floor decking in the area of the break, it was a very dark brown. Dark areas on the decking and floor joists indicated that high temperature flue gases had possibly cooked the sugars or sap in the wood to a dark caramel color. Apparently, the ambient air had a cooling effect on the pipe in exposed areas; that is why the exposed pipe was a lighter brown color. In the floor cavity, the temperature on both sides of the flue pipe wall was the flue gas temperature. Wherever the pipe was near a floor joist or near insulation, the piping appeared to be darker in color. This was probably because of the restriction of ambient air circulation for cooling. The pipe was brown and discolored in the vicinity of the two water heaters, and two yellowish fittings were cracked and completely separated. Testing the flue gases in this case revealed that flue gas temperatures after the dilution air was added was still much higher than the 160 F hot water temperature and far in excess of the temperature rating for PVC pipe. The water heater manufacturer's literature recommended the use of PVC pipe and made no mention of system design temperature limitations or installation requirements for the PVC flues with respect to the location in a concealed space or adjacent to insulation. It also did not list any temperature limitations for a maximum thermostat setting on the water heater for systems using PVC flues. The PVC flue pipe separations above the drywall ceiling allowed products of combustion, including carbon monoxide and water vapor, to vent under positive pressure into the house over several years. This caused excessive mold and water damage to the structure. There is not much data on discoloration of PVC pipe or on ambient air cooling requirements for PVC flue pipes. It appears that PVC flue pipes should not be located in concealed spaces such as the space between a ceiling and a floor deck, near insulation or floor joists or in wall cavities that have no ambient air cooling capability. There is no standard for PVC pipe for use as a flue material for combustion gases and there is no testing for these conditions. When the home was being sold, an inspector found significant water damage in the lower levels. A plumbing contractor opened the drywall ceiling on the lower floor and found the two completely separated PVC flue pipes pumping carbon monoxide and moisture into the home. There was black mold throughout the floor space and on the exterior walls, where the wood structure and siding was rotted. Copper plumbing pipes in the area were green with oxidation from exposure to the moisture. The broken PVC flue pipes caused the plumbing contractor to wonder whether the building occupants had experienced any symptoms of carbon monoxide poisoning. These symptoms include the following: headaches, dizziness, nausea, flu-like symptoms, fatigue, shortness of breath, impaired judgment, chest pain, confusion, depression, hallucinations, agitation, vomiting, abdominal pain, drowsiness, visual changes, fainting, seizures, memory and walking problems. Not knowing her condition, the plumber contacted the homeowner and asked whether she had experienced any of these symptoms. She was amazed to hear this, because he was describing many of the symptoms she had been experiencing for several years. These were the reasons she had to quit her job and move away. Moving away very likely saved her life. Interestingly, although the CO levels were elevated to dangerous levels, they were not high enough to trip a carbon monoxide alarm. The combustion gases that were venting into the floor space and coming up through a floor register into the living space had oxygen levels that dropped to well below 18 percent in some areas. Low oxygen levels combined with elevated CO levels can be a deadly combination and can lead to brain damage. PVC pipe has a temperature limit of 140 F; most water heaters and boilers have thermostats that exceed this temperature. Furnaces can have flue temperatures well above 140 F when the air filters are dirty and the air flow drops off. The maximum temperature setting for residential water heaters is 160 F, for commercial water heaters it is 180 F and for boilers it is 200 F, all above the maximum recommended PVC temperature of 140 F. Boiler water temperatures are typically in the 180 to 200 degree range, because most HVAC hydronic heating coils are designed for these higher water temperatures in order to reduce the heating coil sizes and to reduce the gpm pumping requirements. Plumbing engineers typically design hot water systems to store hot water about 140 F in water heaters to minimize Legionella bacteria and other organic pathogen growth in the hot water tank. They typically use thermostatic mixing valves conforming to industry standards to reduce domestic hot water temperatures to safe delivery temperatures. If a fuel gas appliance was 100% efficient, the flue gas temperature would be the same temperature as the thermostat setting or fluid temperature in the water heater or boiler. Since 100% efficiency is not really possible, all flue gas temperatures will exceed the thermostat setting. So, if a water heater is set at 160 F and the thermostat allows the fluid temperature to overshoot the set point by about 10 degrees F plus or minus, the flue gas temperatures on a very efficient residential water heater would be higher than 170 F. This is consistent with the temperature readings I got. I serve on an industry committee that is developing guidelines for minimizing Legionella in building water systems. The committee includes representatives of ASHRAE, ASPE, water heater manufacturers, plumbing designers, CDC, EPA, several pathologists and microbiologists and many other experts. They have recently tentatively agreed that the minimum storage temperature for water heaters should be 140 F in order to make sure that all parts of the domestic hot water system are well above the ideal growth temperatures for Legionella. The committee is also looking at minimum hot water return temperatures above the ideal growth temperatures for legionella bacteria. When this standard is published, storage type water heaters will have minimum storage temperatures of 140 F or higher; flue gases are typically much hotter than the water temperature. Water heater, boiler and furnace manufacturers have gone to great lengths to promote and use PVC plastic flue pipes in applications that exceed the temperature ratings of the product. They cannot use traditional galvanized flues because the condensation produced is pure water and very aggressive and would corrode or rust the flue in a very short time. When galvanized steel flues develop rust holes, people may start suffering from carbon monoxide poisoning. Manufacturers needed to come up with a flue material that would not corrode. Stainless steel flues are an option but, compared to galvanized steel or PVC plastic, they are very expensive. High-temperature plastic flues were used briefly in Canada but were recalled after a series of flue failures. In the beginning, flues were cobbled together out of whatever flue materials they could find and PVC was included even though it is not rated for the system temperatures commonly experienced in flues. Water heater and boiler manufacturers began listing the ASTM standard numbers for PVC DWV pipe and PVC water pipe as the material to use for venting their appliances. This standard specification does not include requirements for pipe and fittings intended to be used to vent combustion gases. The cost of PVC plastic pipe cost is a fraction of the cost of stainless steel. I am guessing that there was a meeting after the May 2011 article and that AHRI decided to defend the use of PVC plastic for venting combustible gases. The AHRI representative agreed that no U.S. PVC pipe manufacturer recommends use of their pipe for venting of combustible gases. He then goes on to mention that AHRI uses the ANSI Z21 series of standards for appliance testing as the basis for acceptance of PVC flue piping. These standards only test for deflection at 157 F, although he claimed that they test to 158 F. That is not the correct temperature for PVC piping. He states that the Z21 series of standards tests gas appliances for extreme conditions. According to him, the test involves setting the thermostat to the highest setting and flowing water continuously to keep the burner on. In this condition, enough water can be flushed through the water heater or boiler to keep the water temperatures low enough to keep the flue gases cooled and relatively low. The test does not allow real-world conditions in which commercial water heaters reach the shut-off temperature of 180 F.
To be accurate, just enough hot water should be flowed to cause cold water to enter the bottom of the heater and cause the burner to come on; then the flow of water should be shut off until the burner shuts off. Repeating this step about five or six times would be the real-world extreme condition. Each time the water heater cycles, the hot water rises to the top of the heater; each consecutive cycle overheats the water in the top of the heater and, with each consecutive stacking cycle, the water temperature will be 5 to 10 degrees hotter. As the water temperature gets hotter, so does the flue temperature. The test does not test for long term thermal cycling of the PVC pipe where the pipe becomes discolored. The test does not address all of the things that can cause flue gas temperatures to rise — scale on the heating surfaces; dirty air filters; insulation, drywall or studs against the pipe in joist spaces; partially and fully blocked dilution air inlets; etc. I would like to see a manufacturer provide a copy of testing and certification for any fuel burning appliance with PVC pipe testing for these conditions. There is no testing for a water heater, boiler or furnace that has a system set at the upper temperature settings with a build-up of scale on the heating surfaces or with a plugged air filter. Scale on heating surfaces and higher system water temperatures that increase scale production are not extreme cases but are normal conditions expected over the life of a water heater or boiler. The AHRI representative states in his letter that scale is not an insulator. I strongly disagree. Numerous documents, research reports and papers address the insulating effects of scale formation on the heat transfer surfaces and the waste of energy associated with scale on heating surfaces. The insulating effect of scale on water heater and boiler heating surfaces results in increased flue gas temperatures. Scale also causes a substantial waste of energy. Scale deposits occur when calcium, magnesium and silica, commonly found in most water supplies, get cooked onto the heating surface and form a continuous layer of material on the waterside of the water heater or boiler heat exchanger surfaces. Scale creates a problem because it typically possesses a thermal conductivity, an order of magnitude less than the corresponding value for bare steel. Even thin layers of scale serve as an effective insulator and retard heat transfer. The National Institute of Standards and Technology, Handbook 115, Supplement 1 addresses the loss of efficiency based on scale formation. On well-designed natural gas-fired systems, an excess air level of 10% is attainable. An often stated rule of thumb is that boiler efficiency can be increased by 1% for each 15% reduction in excess air or 40 F reduction in the stack gas temperature. The efficiency of the equipment decreases about one percent for every 1/64-inch layer of scale on the heating surface. The result is overheating of the water heater or boiler tube metal, tube failures and loss of energy efficiency, which is commonly diagnosed by an increase in flue gas temperature. Fuel consumption increases as scale deposits increase. Water heater or boiler output will be reduced as the scale builds up. The flue gas temperatures rise, and the burner stays on longer in order to transfer heat through the scale and the heating surface. Energy losses and increased flue gas temperatures are a function of scale thickness and composition. A flue pipe should not be allowed to fail and cause an injury or death from a normal system temperatures, location of a flue in a concealed space, or a normal build-up of scale on the heating surface. This is a serious life safety issue that the appliance manufacturers apparently would like to sweep under the carpet. At the ASHRAE show in Chicago, I asked every water heater and boiler manufacturer that was exhibiting PVC flues on their equipment to show me any testing data they might have that shows the PVC material was not going to exceed 140 F. Some looked at me like deer in the headlights, others rolled their eyes, and a few said they didn’t know and suggested I talk to “that guy over there.” The guy over there did not know either. A few said, “Yeah, everyone’s using PVC now, and I have never heard of a failure.” Not one manufacturer could produce any technical data or a report addressing the temperature limits that the fuel burning appliance manufacturers are required to have for non-metallic PVC flue materials. There are acceptable non-metallic flue materials such as high temperature polypropylene and new, high temperature plastics that have higher temperature ratings than PVC. The fuel-fired appliance manufacturers, in their quest to use PVC pipe as an inexpensive flue material, realized that no piping manufacturer was going to go out on a limb and certify their pipe for use as a flue gas material, so a proposal for a code change was submitted to the International Fuel Gas Code to allow an exception for the listing requirements for flue gas materials. The exception allows for non-metallic flue materials to not be required to be listed for the application if the manufacturer of the equipment certifies their equipment for use with non-metallic flue materials. They are claiming that they have a certification test, but the test that the AHRI representative cited does not test for the proper temperature limits for PVC pipe. I would be glad to show them how to set up a realistic test. The AHRI representative went on to talk about dilution air being mixed with the flue gas temperatures. This dilution air is often drawn into the water heater through openings in a hood on top of the water heater. It is a function of the size of the combustion air fan which, in many cases, is located on the flue outlet so there can be a negative pressure zone on top of the water heater where dilution air can be drawn into the flue. The dilution air imposes an additional CFM demand on the unit that is not covered in the manufacturer’s installation data. There is rarely manufacturer’s data on what the fan CFM is and how that affects the combustion air requirements for the water heater or appliance. If there are two appliances located in the same closet and both rely on cooling air mixing with the combustion gases, where are the additional requirements for combustion air openings and dilution air requirements? If a closet or space is designed for only enough air for the combustion requirements, and the hood is drawing many times more cubic feet of air than the combustion air requirement from the same space, the burner can starve, and improper combustion can cause soot conditions that will increase flue temperatures. Improper airflow to the closet or room containing the high efficiency equipment can starve the dilution air ports reducing the cooling capability of the dilution air that is intended to help cool the combustion gases. High ambient air conditions can also cause ineffective cooling of the combustion gases. Until any fuel burning appliance manufacturer can produce an independent engineering lab test report that shows that the appliance will shut down if the flue gas temperatures exceed 140 F, an engineer or the inspector has every right to reject the PVC flue materials as not being in compliance with the requirements for listed flue pipe materials in the International Fuel Gas Code. Fuel burning appliance manufacturers should change their installation literature to prohibit PVC pipe and fittings. They should require other more suitable high temperature non-metallic pipe materials or stainless steel flue materials. They should also address all of the thermal expansion, ambient cooling and stress cracking issues with non-metallic systems. A consensus standard for non-metallic flue venting systems is really needed now if they are going to continue to promote the PVC material. The manufacturers and AHRI have created an unsafe condition by lobbying for a material that is not suited for this application. They should issue a recall letter to every business and every homeowner that has PVC flue pipes installed on equipment designed for non-metallic flue pipes if the equipment does not have temperature sensors or limit switches in the discharge flue that shuts down the burner if the flue gas temperatures exceed 140 F.
Data also needs to be published showing the dilution air requirements at the maximum possible ambient air conditions. Recent weather events in Southern states have shown that ambient air conditions can get close to 115 F or higher. With combustion gases close to 200 F, you would need a pretty big combustion air opening to bring in enough 115-degree cooling air to bring the temperature down to a safe level. The decision to use PVC pipe for venting flue gases is purely a monetary decision; it totally disregards public health and safety. The International Fuel Gas Code exemption for non-metallic flue pipe materials is not safe and, in my opinion, should be repealed as an emergency code change. I also feel that manufacturers should immediately discontinue recommending the use of PVC pipe for venting combustible gases. Ron George is president of Plumb-Tech Design and Consulting Services LLC. He has served as chairman of the International Residential Plumbing & Mechanical Code Committee. Visit www.Plumb-TechLLC.com, e-mail Ron@Plumb-TechLLC.com or phone 734/755-1908.